See the amazing views of Uluru bathed in sunset light and Kata Tjuta as you hike 4-hour through the national park. Learn the history and geology of the park from your guide on one of two trails before enjoying light refreshments. Hotel pick up and drop off from Yulara for a relaxed experience. After your pick-up at 2pm from Yulara, your first stop will be Kata Tjuta (The Olgas). You will wander through the landscapes of its 36 domes and learn about the geology of the place with your experienced tour guide. Depending on the season, your guide will either take you on the "Valley of the Winds" walk or the Walpa Gorge walk (The Valley of the Winds is closed when forecasted temperature is above 36 degrees Celsius). 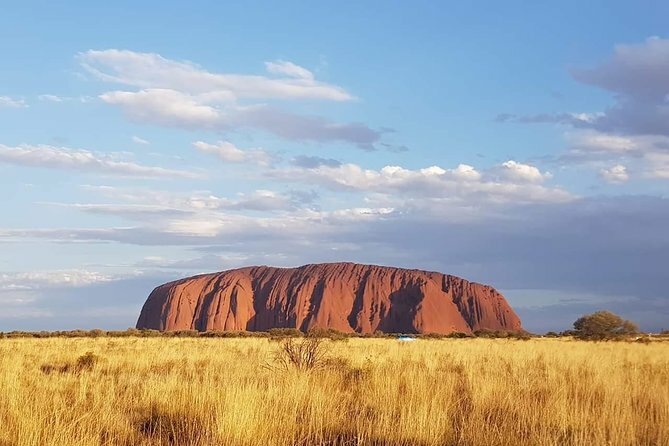 Then the tour will make its way to the sunset viewing area at Uluru. You will experience the most iconic sunset viewing spots in the world whilst having a drink and some nibbles. You will be amazed by the display of color and light on the Rock. You will then be dropped back at your accommodation about half an hour after sunset.